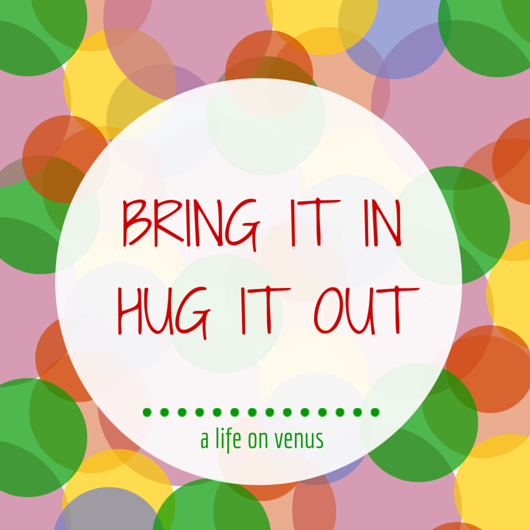 A Life on Venus: Bring it in. Hug it out. Bring it in. Hug it out. Hugs! Aren't they the best. They are warm and snug, making you feel safe. And get this, they are good for! I'm a hugger from way back. I am that person who hugs tight and lets go last. Hubby and the kids are constantly heard saying, "Let go!". But sometimes I want to hold on forever being warm, snug and safe. This week I have started a saying, "Bring it in. Hug it out". I say this to my nearest and dearest when they are cranky, sad or crying. I'm asking them to come closer, "Bring it in" and then cuddle, "Hug it out". So even if you don't feel like hugging, do it anyway. It just might help turn that frown upside down and show someone that you care for them. Go on, "Bring it in. Hug it out!" Do you love to hug?